A compound objective links multiple causative objectives into a grouping on a Strategy Map. When included on a dashboard, a view, or a Strategy Map, a compound objective displays the aggregate values of the contributing objectives. The following image shows a sample compound objective on a Strategy Map. The compound objective is named Blended Profit Goal. In this example, the contributing objectives are Profit up 20 Pct and Margin up 10 Pct. Those objectives were assigned a weight (priority) by the author at your site. A risk represents a specific problem or threat to your enterprise. A consequence links multiple causative risks into a grouping on a Strategy Map. A consequence displays the aggregate values of the contributing risks. 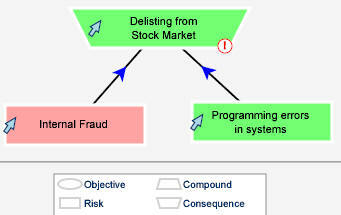 The following image shows a sample consequence on a Strategy Map. The consequence is named Delisting from Stock Market. In this example, the contributing risks are Internal Fraud and Programming errors in systems. Those risks were assigned a weight (priority) by the author at your site. On a Strategy Map, you can click an object type on the legend to highlight that specific type. For example, you can click Risk on the legend to highlight only the risk objects on the Strategy Map. This capability supports a live discussion about the risk performance of your business strategy.